So let me assure you, this article isn’t that. And I won’t be sharing precautionary tales of fishing trips gone bad due to augers that wouldn’t start or long walks owed to a snowmobile that would only run in reverse and then only at 3 mph or less. Yes, that one actually happened to me and the issue was almost certainly caused by 2 year old fuel that had achieved the consistency of corn syrup. How we thought that batch of petroleum gone bad would simply “work its way through the system” is beyond me. Live and learn I guess. And I have lived and learned, albeit painfully slowly at times. For a good chunk of my life I’ve had a “roll the dice and take my chances” approach to preventative maintenance. And there were times I got away with it too. But those times were more the exception than the rule. It goes without saying, I’ve learned a few painful lessons about the saying, “an ounce of prevention is worth a pound of cure.” When I was a kid, that was something my grandmother said right before I did something shortsighted. Of course now that I’m officially a recovering procrastinator I’ve accepted as truth the point my grandmother was trying to make all those years ago. A little effort now (the ounce) will ward off troubles that will require a lot more effort (the pound) to solve down the road. My reason for writing this article is fairly straightforward. We all know that we should be winterizing, or summarizing depending on the situation, our equipment powered by internal combustion engines. Yet many don’t and we hear the same tales of woe season after season. “My (insert brand here) auger ran perfect when I put it away last spring and now I can’t get it to start and when it does it bogs down as soon as I touch the throttle.” Sound familiar? What changed over the summer? If that auger ran fine late winter it stands to reason that it should run just like you left it. After all, none of the carburetor settings changed themselves while in storage. But something did change. The fuel, over the course of the summer, changed dramatically. Most people know that fuel will break down over time if left untreated but most have no idea how quickly this takes place and how significantly the quality of the fuel is degraded. In this first photo we have two mason jars filled with the same amount of fuel in each jar which will be monitored for 30 days. In this case the fuel is “E-0″ meaning it contains no ethanol. 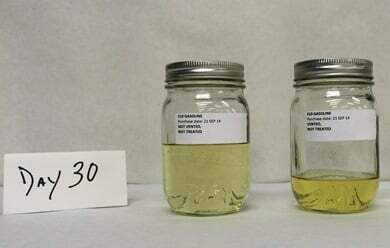 The first jar is “not vented” to show the original amount of fuel added to each jar. With no way for any of the fuel to evaporate the amount of fuel in this jar will not change over time. What you’ll notice with a quick glance is that the second jar which was “vented – not treated” has lost nearly 50% of its volume in 30 days. 30 DAYS! I for one had no idea this type of loss could take place so quickly and it puts in perspective the changes the fuel in my auger or other winter-use equipment is going through when stored from April to October each summer. One thing worth pointing out, most popular fuel stabilizers do nothing whatsoever to resist fuel evaporation or preserve ignition vapors. In fact, most of them cause fuel to be less volatile as soon as you add the treatment. If you use the wrong stabilizer this only compounds the problem. Another thing you’ll notice after a closer inspection is the discoloration of the fuel in the second jar. 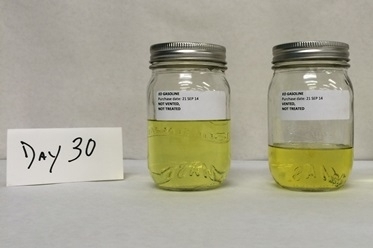 This color change occurred as the lighter, more volatile compounds in the fuel evaporated off and oxidation of the remaining fuel started to take place. With 50% of the fuel volume now gone and the most volatile compounds missing, the ones that are most likely to ignite, tell me again why that auger won’t start even though it was working great when you used it at the end of last winter? In this next photo we see the same test run using E-10 fuel – that’s 10% Ethanol blended with the gasoline. As in the first test, the first jar is “not vented” to show the original amount of fuel added to each jar. With no way for any of the fuel to evaporate the amount of fuel in this jar will not change over time. The loss of fuel to evaporation is even more pronounced in this test than it was in the test on the E-0 fuel! So this brings me to that “ounce of prevention” I mentioned early on in this article. In this instance that would be 1 ounce of Sea Foam per gallon of gasoline. I’ve been using this stabilizer since I started down the path as a recovering procrastinator and it has never failed me. If you take anything from this article I hope as a reader you walk away with an understanding of the importance of winterizing your equipment and the role a good fuel stabilizer plays in the process. 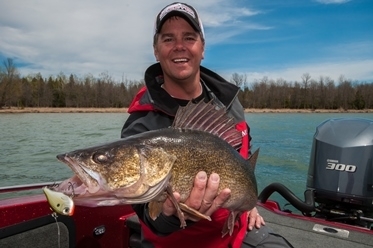 James Holst is the host of In-Depth Outdoors. Producing their top-rated show requires the In-Depth staff to maintain a large stable of trucks, snowmobiles, augers, and boats. In 2014, the In-Depth crew traveled 26,692 miles across the Midwest and Canada without a single mechanical issue. James’ current Cylinder Index is 41.